Where can I find details about faxes I have sent? Send files saved in your computer or stored in Documents as a fax. 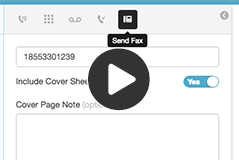 Tip: To share files with other users without sending a fax, use the share a file feature in Documents.